Scott-Clark Medical is a specialist supplier of Industrial Mobile Computer Workstation technology. Industrial laptop carts are a popular item in the range. For hospital workers, specifically those involved in IT and nursing where a lot of time is spent inputting and analyzing electronic medical records (EMR), the innovative technology that has been developed in our next generation of mobile computing improves efficiency and confidence at the point of care. Nurses are regularly exposed to a degree of manual handling while helping maneuver patients and stretching over beds. 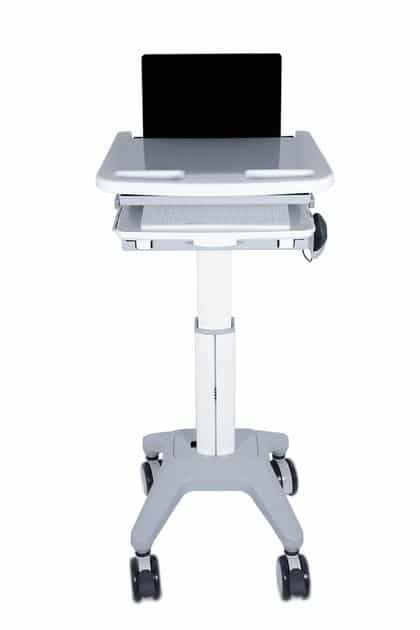 The ease of transporting the laptop cart can help to reduce the incidence of injuries, strains and therefore time off work. Construction from lightweight aluminum gives up to a 75% reduction in weight as compared to a traditional mobile workstation. Despite the lightweight, our laptop carts are still exceptionally strong and able to support the powerful batteries, medical supplies, computer, and printer. The dual batteries offer up to 80% more energy storage and a reduction in charging time of 50% over standard batteries. You will not experience downtime and interruptions, allowing EMR to be inputted and accessed efficiently. At Scott-Clark Medical, we have vast experience and expertise in carts we can customize a product to suit your needs. Managing your cart has been designed with simplicity and usability in mind. The long-life batteries offer safe, clean energy and the lithium-ion technology will ensure years of service. There is a bright status light to keep you informed about when the next charge is needed, so you don’t lose power halfway through a procedure. The batteries are common throughout the range and can be swapped between carts should you not have time for a complete charge. Industrial laptop carts are manufactured with the user in mind. We understand that hospital personnel will be different sizes, shapes and have individual comfort needs. With that in mind, our carts have been made to be height adjustable, enabling everybody to position the workstation to suit their own positional needs. 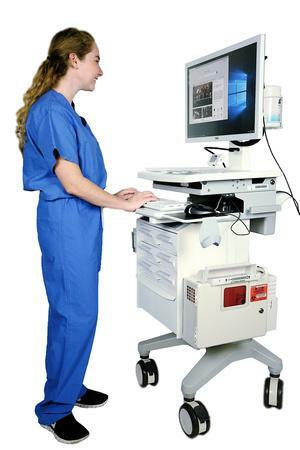 Every hospital has their preferred style of computer and type of display, regardless of which you use it, will be supported by your chosen cart. Laptops and tablet computers will fit as standard on the cart, but desktop computers can also be configured. If you choose to use very large external displays, which are becoming increasingly common, this is also no problem as our carts are capable of holding these. The integrated BCMA is particularly easy to use. The medication bin fits robotic fill systems for simple restocking. For added security, the quick lock system prevents unauthorized removal of medicines and the high-quality manufacture results in a silent operation. If you have any specific requirements, carts can be customized to support a range of additional accessories. Sometimes two screens can be needed for viewing separate information at the same time without having to move between the two on the same screen. PACS viewing can be configured to work in conjunction with the standard display. To further assist with safety and efficiency, a sharps bin is incorporated into the design of the laptop cart. At Scott-Clark Medical we fully understand the details that are important to making your work environment safe and comfortable. We can offer advice on which product is the most suitable for your needs or work together to customize a product to exactly fit your needs.